A veteran member of and contributor to the Finesse News Network recently alerted us about several of the soft-plastic baits that the BioSpawn Lure Company of Chicago is manufacturing. He more than hinted that we have failed to keep the Midwest finesse world up to date with this company’s endeavors. Once we saw what he was talking about, we wholeheartedly agreed with him. This angler then suggested that we begin this task by focusing on their unique ExoStick, which he described as a state-of-the-art stick-style bait. As we began to amend this failure, we worked with Josh Slawkin, Eli Rosenberg, and Andrew Schreiber at BioSpawn Lures and Catch Co. They answered our questions, put us in touch with two members of BioSpawn’s pro staff, and sent 16 green-pumpkin ExoSticks for us to examine, measure, work with, and describe. Slawkin told us that the ExoStick was introduced to the angling world in 2014. Initially, they manufactured two models. One was called the ExoStick XT, which was salt-free and possessed what Slawkin described as “a slower drop rate” than the ExoStick Pro. The second one was the ExoStick Pro, which was impregnated heavily with salt and not buoyant. Nowadays, they manufacture only the ExoStick Pro, which they call the ExoStick. It is exactly five inches long and embellished with 18 cone- or semi-cone-shaped segments and one dome-shaped segment. 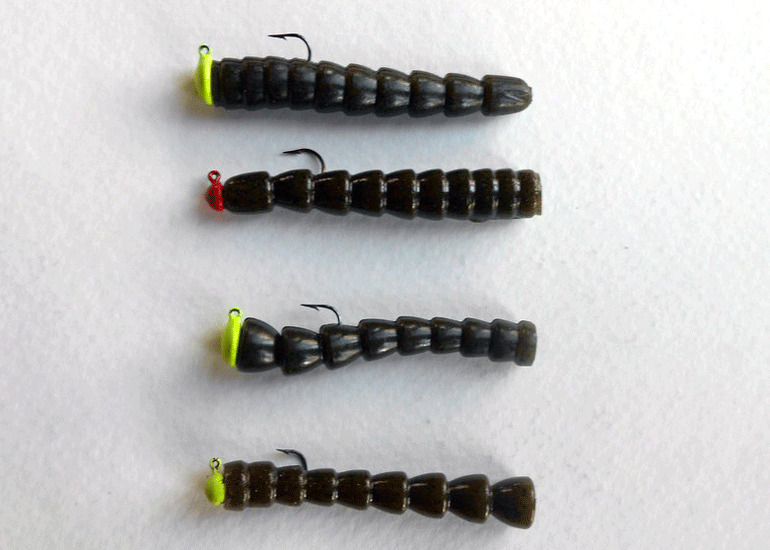 According to the BioSpawn staff, these 19 segments provoke it to perform differently than other stick-style baits. The anterior portion of the ExoStick consists of six segments. This section is 1 7/8 inches long. The first segment is its head, and it is dome shaped. The head is seven-eighths of an inch long and a quarter of an inch wide at its widest spot with a circumference of about 11/16 of an inch. The widths and circumferences of the anterior’s five cone-shaped segments increase as they reach the mid-section of the ExoStick’s torso. The second segment is three-eighths of an inch long and five-eighths of an inch wide with a circumference of about 1 1/8 inches. Its sixth and final segment of the anterior is a quarter of an inch long and seven-sixteenths of an inch wide with a circumference of 1 5/16 inches. The midsection of the torso consists of seven segments. It is 1 3/8 inches long. These segments are not as pronounced as the anterior ones and posterior ones. Segment number seven is three-sixteenths of an inch long and three-eighths of an inch wide with a circumference of about 1 3/8 inches. The segments of the torso’s midsection become smaller as they merge with the posterior portions of the ExoStick, but they become gradually more noticeable than segments number seven, eight, nine, and 10. Segment number 13 is a quarter inch long and five-sixteenths of an inch wide with a circumference of about one inch. The posterior section is 1 7/8 inches long. It is endowed with six segments, which are the ExoStick’s most conspicuous ones. Segment number 19 is its tail, which three-eighths of an inch long, and it is the most prominent one of the lot. The tip of the tail is flat and seven-sixteenths of an inch wide with a circumference of 1 15/16 inches. The length of the first segment of the posterior, which is the ExoStick’s 14th segment, is a quarter of an inch, and it is five-sixteenths of an inch wide with a circumference of an 1 1/16 inches. 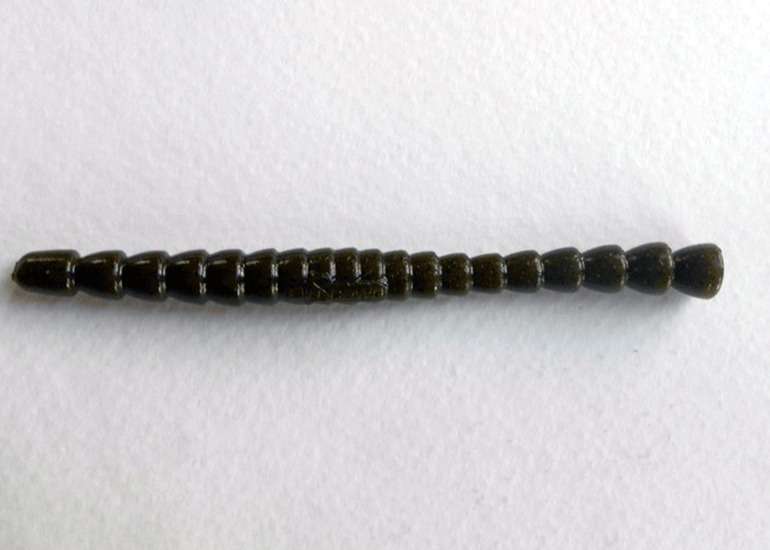 The epidermis of the ExoStick is smooth, but a small portion of segments seven, eight, nine, and 10, are embossed with the word BioSpawn. It is manufactured in the following colors: Bama Bug, Black Blue Flake, Candy Grass, Feider Shad, Green Pumpkin, Junebug, Okeechobee Craw, Red Bug, Red Shad, Sprayed Grass, Watermelon Red, and White Silver Flake. It is impregnated with salt and a scent that is called BioScent, which consists of anise, amino acids, and fish oils. The folks at BioSpawn recommend that anglers employ it with a Carolina rig, drop-shot rig, Texas-style rig or slip-sinker rig, shaky-head jig, and wacky rig. They also suggested that we should talk to Seth Feider of New Market, Minnesota, and Josh Douglas of Isle, Minnesota, about the ways that they use it. Feider and Douglas are friends and members of BioSpawn’s pro staff. And during the past several years, they have worked together on several piscatorial projects, such as webinars and YouTube productions. Feider is a veteran guide and successful tournament angler, and nowadays he spends a lot of time competing on the Bassmaster Elite circuit. Feider uses the ExoStick several ways. For instance, he worked with a wacky-rigged Feider Shad ExoStick on a drop-shot rig at the Bassmaster Elite tournament at Lake St. Clair, Michigan, on Aug. 24-27, 2017, to help him catch 15 smallmouth bass that weighed 57 pounds, 11 ounces. He customizes the wacky-rigged ExoStick for smallmouth bass applications by removing two of the cone-shaped segments at each of its ends, making it four inches long. When he is in pursuit of largemouth bass with a wacky-rigged ExoStick on a drop-shot rig, he does not shorten it. Besides wacky rigging the ExoStick, he has Neko rigged it, used it on a shaky-head jig, and worked with it on a Texas-style rig. What’s more, Feider shortens it, making it 2 1/2 to three inches long, and affixes it to an Outkast Tackle’s Money Jig, which is a mushroom-style jig and a standard Midwest finesse tactic. Like Feider, Douglas is a veteran guide and successful tournament angler. He competes on the FLW Tour and Bassmaster Eastern Open circuits. Douglas rigs the ExoStick three ways. When he is fishing around patches of water lilies, he rigs it Texas style with a quarter-ounce slip sinker. He has found that as he works it into the gaps between the water lilies, the ExoStick's unique and flat tail exhibits alluring and matchless gyrations and undulations as it plummets towards the bottom. In other words, it is a wowie-zowie stick-style bait. Douglas also wields it wacky style on a drop-shot rig and on an Outkast Tackle’s Money Jig. When he wacky rigs it on a drop-shot rig, he is focusing on individual smallmouth bass that he locates with a sonar devise. These individual smallmouth bass are usually abiding adjacent to a boulder. To allure them, he shortens the ExoStick to four inches by removing two of the cone-shaped segments from each of its ends. Then, he vertically presents the ExoStick to the smallmouth bass that he is observing via his down-imaging sonar. When Douglas affixes the ExoStick to an Outkast Tackle’s Money Jig, he shortens it by cutting it in half, making it 2 1/2 inches long. This Midwest finesse tactic allows him to present it to largemouth bass, smallmouth bass, and spotted bass with a variety of retrieves and in various depths of water. (1) Here is a link to BioSpawn Lure Company’s website: https://biospawn.com/products/exostick-pro. (2) Here is a link to a website that explains how Seth Feider employs an ExoStick wacky style on a drop-shot rig with a pendulum-style presentation: https://thebasscast.com/how-to-use-a-stick-bait-to-imitate-suspended-shad-mystery-tackle-box-september-152017/. (3) Here are two links to the Midwest Finesse columns that features Josh Douglas’ and Seth Feider's ways with a marabou jig: //www.in-fisherman.com/gear-accessories/the-marabou-jig-according-to-josh-douglas; //www.in-fisherman.com/editorial/the-marabou-jig-according-to-seth-feider/154420. (4) Like Douglas and Feider, Midwest finesse anglers will shorten the ExoStick. Some will create two ExoSticks by cutting it in half to make two 2 1/2-inch ExoSticks. The photograph below shows how Midwest finesse anglers will rig the 2 1/2-inch ExoStick onto a mushroom-style jig. The one at the top is a 2 1/2 segment affixed to a 1/16-ounce mushroom jig, and the ExoStick’s head has become its tail. The second one is the same segment as the one at the top, but it is affixed to a 1/32-ounce mushroom-style jig into its head, and the former midsection of the ExoStick has become its tail. The third one features a 2 1/2-inch segment of it posterior section, and its tail has become its head, and it is affixed to a 1/16-ounce mushroom-style jig, and its former midsection has become its tail. The fourth one is the same segment as the third one, but it is affixed to a fixed to a 1/32-ounce jig, and its former midsection has become its head. When it is affixed to a mushroom-style retrieve, Midwest finesse anglers can employ six retrieves or slight variations of those retrieve. Here is a link to a Midwest Finesse column that explains how to execute those retrieves: //www.in-fisherman.com/editorial/six-midwest-finesse-retrieves/153946. (5) In the weeks to come, we will publish gear guides about four-inch ExoSwim and PlasmaTail.